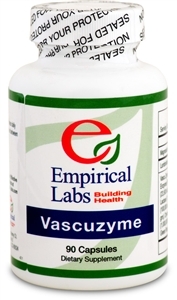 Empirical Labs Vascuzyme ingredients have been selected to work with all the physiological mechanisms that promote clear arteries. The blend of proteolytic enzymes, minerals, antioxidants & herbs to provide a holistic approach to support healthy arteries. 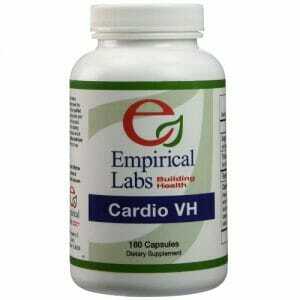 Lumbrokinase: a group of proteolytic enzymes recognized in Chinese Medicine for supporting blood circulation. A 20 mg dose of Lumbrokinase has been shown to support healthy coagulation of blood within normal levels and break down fibrin. Nattokinase: an enzyme isolated from the Japanese soy food natto, that has been shown to support healthy blood flow by assisting the circulatory clearing system of the body. Serrapeptase: a proteolytic enzyme widely used in clinical practice in Japan for its clinically‐proven anti‐inflammatory and fibrinolytic activity. 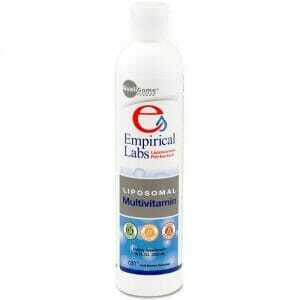 Chymotrypsin: helps prevent tissue damage from plaque build up and fibrin clots. 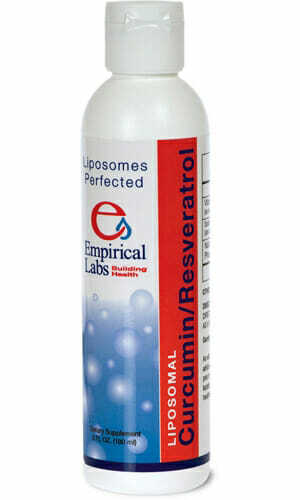 Pancreatin 8x, Plant Enzymes (Protease (58,000 hut), Amylase (23,500 skb), Lipase I & Il (1,100 lu), Hemicellulase (1,560 hcu), Lactase (1,155 fcc), Nattokinase (20,000 fu/gm), Serapeptase (100,000 su/gm), Papain (40,000 fcc/mg), Bromelain (2,000 gdu/gm), Chymotrypsin 1:25, Rose Hip extract, Fennel seed, Protease (1,000,000 hut/gm), Rutin, Hesperidin complex, Quercetin dihydrate, Green Papaya fruit, Papaya Leaf, Milk Thistle seed, Celandine herb. 1. Characterization of antithrombotic activity of lumbrokinase-immobilized polyurethane valves in the total artificial heart. 2. Nattokinase decreases plasma levels of fibrinogen, factor VII, and factor VIII in human subjects. 3. Effects of nattokinase on blood pressure: a randomized, controlled trial. 4. Effect of the proteolytic enzyme serrapeptase on swelling, pain and trismus after surgical extraction of mandibular third molars.